There are millions of books in the world written by hundreds of different authors, each with a distinct style and voice of their own. No two books are alike and that leaves readers with countless options. This is also good news for writers. Since there are a variety of genres in literature, there is always a new book just waiting to be written. And every sub-genre in-between, which means you can combine two genres in one. Do you feel like a kid in a candy store right now? So many delicious options to choose from, but which one do you really want? QUESTION #1: What kind of books do you like to read? QUESTION #2: What kind of movies do you like to watch? For instance: I love to read romance novels and thrillers like J.D. Robb’s “In Death” series, and I enjoy watching movies with nonstop action and supernatural themes, which is why I have a passion for writing urban fantasy with a lot of action and a splash of romance. As soon as you select the genre that you want to write in, there will be no stopping you. A story is an artistic arrangement of words that can make us see a lush green field, hear a baby’s terrified wails, smell delicate orange blossoms, and even taste rich red wine. 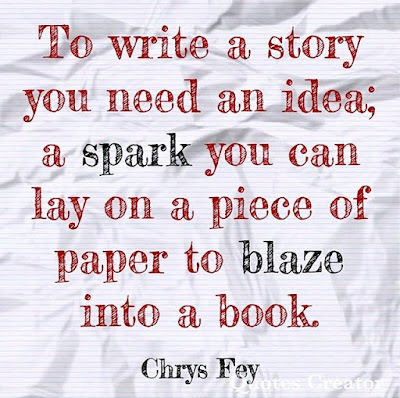 To write a story you need an idea; a spark that you can lay on a piece of paper to blaze into a book. 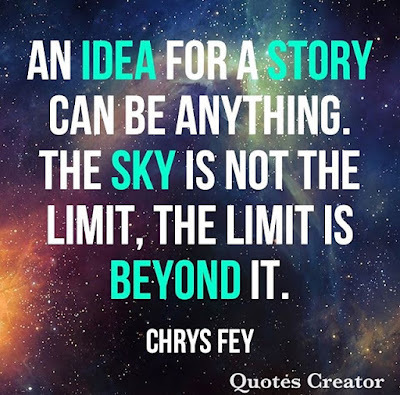 An idea for a story can be anything. The sky is not limit, the limit is beyond it. The idea for a story can be as simple as a young wizard boy (J.K. Rowling), a futuristic cop (Nora Roberts as J.D. Robb), or a haunted hotel (Stephen King). You could get an idea from your grandparents’ great love story that you hear every time you visit them, or from a friend who just went through something good (or bad). It could be a memoir or a true crime that has always fascinated you. You could also get an idea from a bizarre incident, which is how I started writing…. One day, when I was twelve years old, I sat down on a small grassy hill next to my house after a lone game of basketball. I was playing with the sharp blades of grass when my fingers brushed something stuck deep in the roots. I thought it could’ve been a lucky penny or a key to a secret place. Curious, I dug it out and looked at my find. Unfortunately, it was not a penny or a key but a screw. The tip was crooked and it was crusted with orange rust. For the strangest reason, while holding that pathetic screw, a story came to me about an extraordinary girl in an alternate world. I rushed inside my house, grabbed an old notebook and a black pen, and then ran back to that little mound of grass to write the beginning of that story. I wrote fiercely, trying to catch all the words stumbling around in my head. So, as you can see, an idea and inspiration for a story (or a series of them) can literally come from anything. Don’t fight to find a story, let it come to you instead. One day, when you’re least expecting it (that is always the moment) your eyes will widen and you’ll think “that would make a great story!” and voilà! 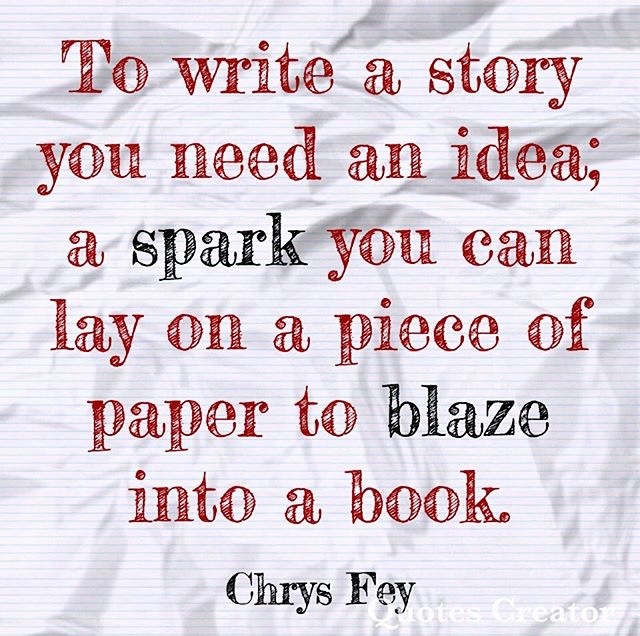 Now capture that spark with both hands and set it on a piece of paper to blaze. QUESTION: What sparked your urge to want to write (a novel)?